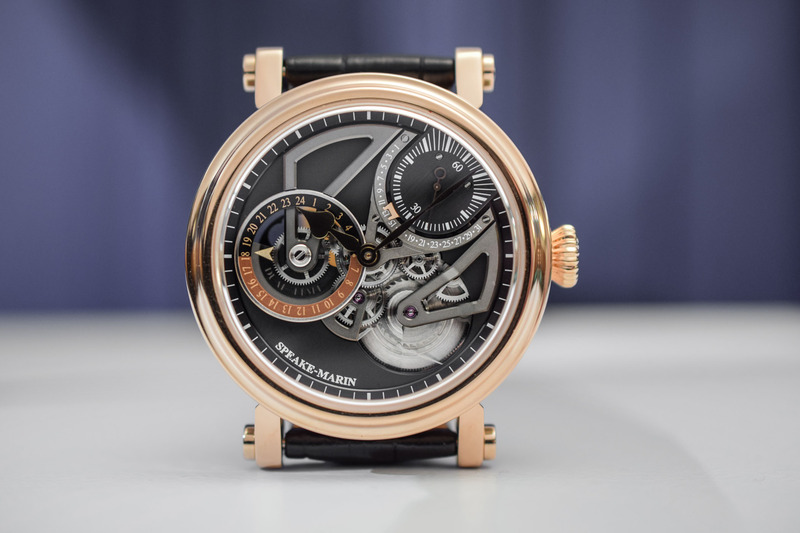 Speake-Marin upgrades its proprietary automatic calibre with dual time and retrograde date functions and exposes the mechanics of the watch with a contemporary openworked dial. 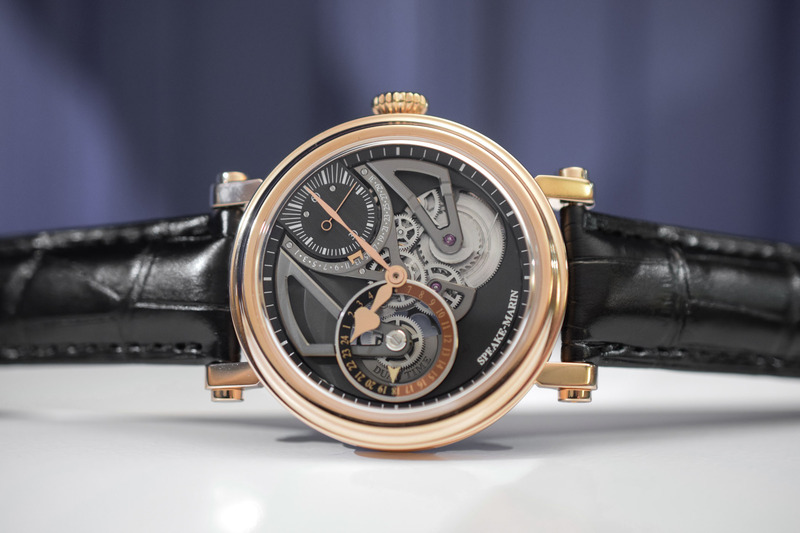 Following in the footsteps of the successful time-only One&Two Openworked model launched in 2017, Speake-Marin unveiled its latest One&Two Openworked model with a dual time function and a retrograde date display at the SIHH 2019. The new Dual Time model builds on the brand’s base SMA01 calibre with two new complications and steers the design codes into a more contemporary direction with an intrepid combination of classic details and defiantly technical elements. 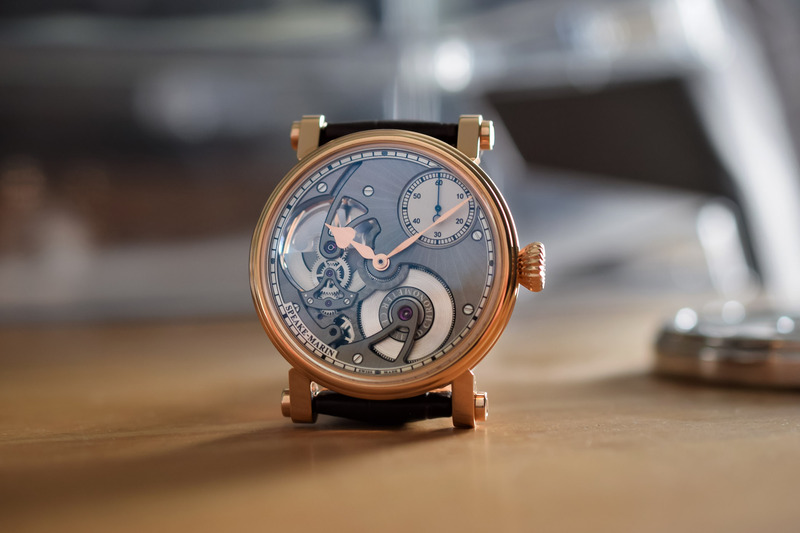 In 2015, Speake-Marin decided to pool its mechanical resources under one roof to develop and assemble its proprietary movements in its atelier in La Chaux-de-Fonds. 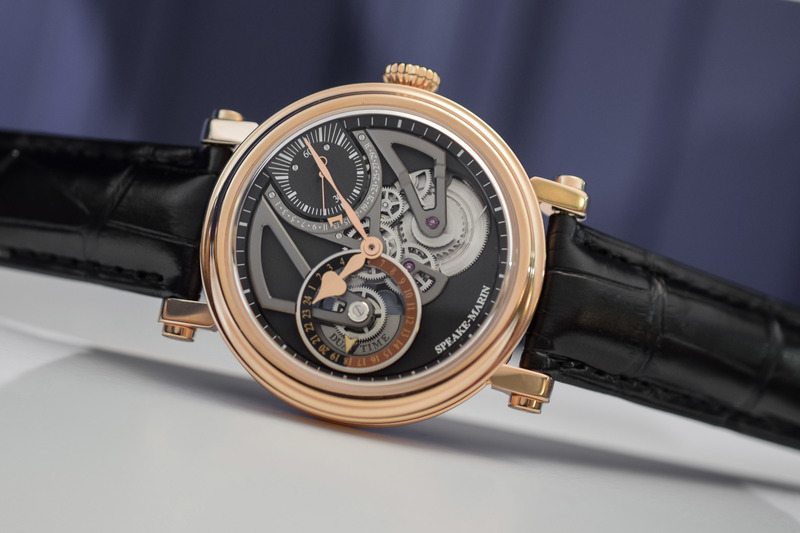 Having started with Haute Horlogerie movements in the form of a minute repeater and a double tourbillon, Speake-Marin decided to concentrate on simpler hour, minutes and seconds movements. The first base calibre to emerge was SMA01, a COSC-certified automatic movement with an integrated micro-rotor and the unusual location of the small seconds counter at 1:30. Making its debut on board the One&Two Openworked time-only model, the skeletonised dial was designed specifically to show off the SMA01 movement, with views of the micro-rotor at 9 o’clock, the barrel at 5 o’clock, and the small seconds at 1:30. 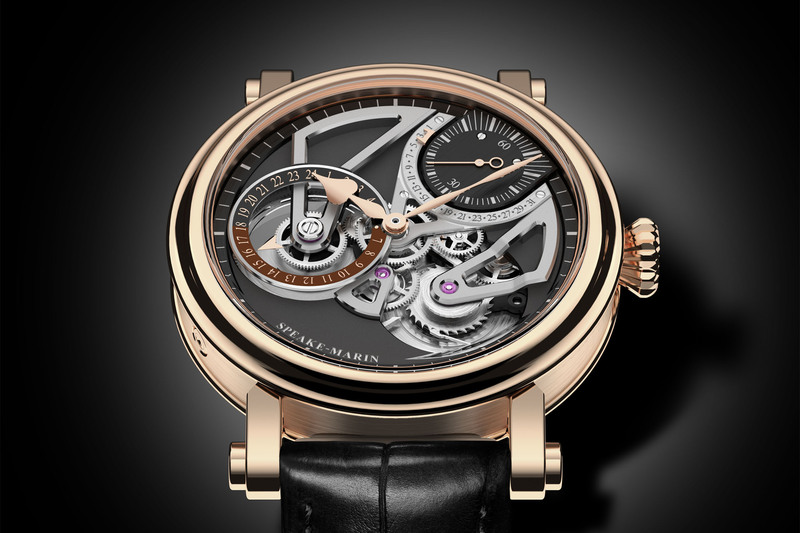 A variation of the base movement (SMA03) has also appeared on the closed dial of the One&Two Academic, but both SMA01 and SMA03 calibres are limited to hours, minutes and seconds functions. 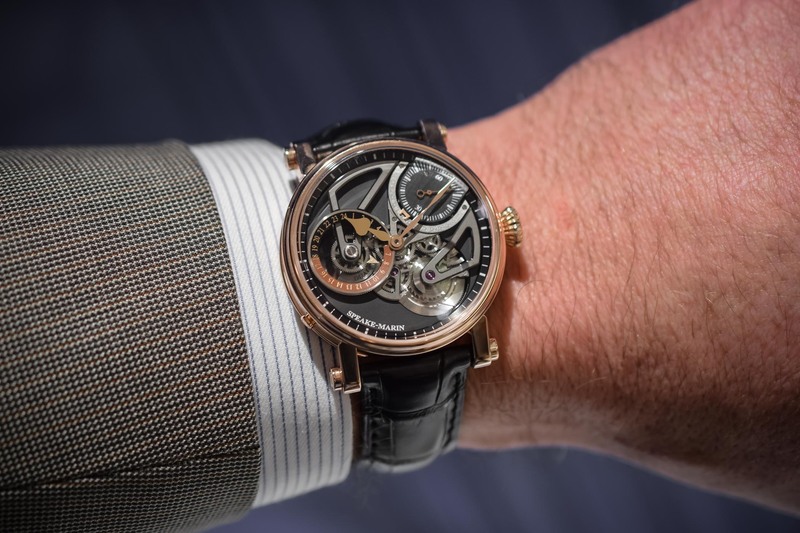 This year, at the SIHH 2019, Speake-Marin presented the One&Two Openworked Dual Time with its proprietary SMA02 movement with dual time and retrograde date complications. The Piccadilly case, first introduced in 2003, is a cornerstone of the brand’s identity. With its generous drum-like case shape, stepped bezel, protruding lugs and fluted crown, the case is almost impossible to mistake with any other case on the market. Recently refreshed with the help of designer Eric Giroud, the Piccadilly now has a thinner profile (10.5mm) and more ergonomic, arching lugs. The idea was to make the case more wearable and comfortable without sacrificing its regal temperament. Another bonus is that the One&Two models come in two case sizes of 38mm and 42mm, meaning there is a size out there for most wrists. The watch strap also sits much closer to the case and the crown is nestled deeper into the case for a more streamlined, contemporary look. With its alternating polished and brushed surfaces, the warm 18k red gold of the case is classic yet distinctive enough to set it apart from the crowd. A discreet pusher, located at around 7 o’clock on the case band, is used to adjust the date function. British gentlemen like to cultivate a certain eccentricity in their dress code. A jaunty neckerchief, loud socks or a worn-out pair of Church’s are telltale signs of this idiosyncratic spirit that refuses to conform blindly to fashion’s dictates. 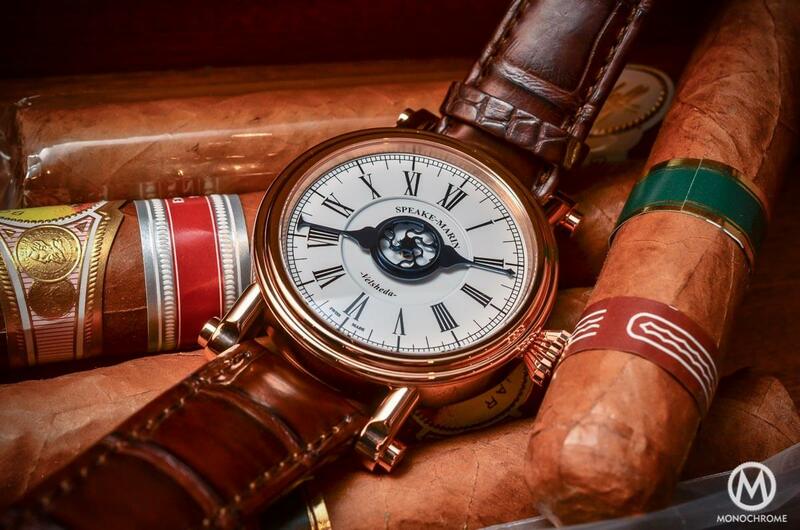 Speake-Marin taps into this slightly irreverent – but always dapper – British style playing with volumes, asymmetry and unconventional layouts. 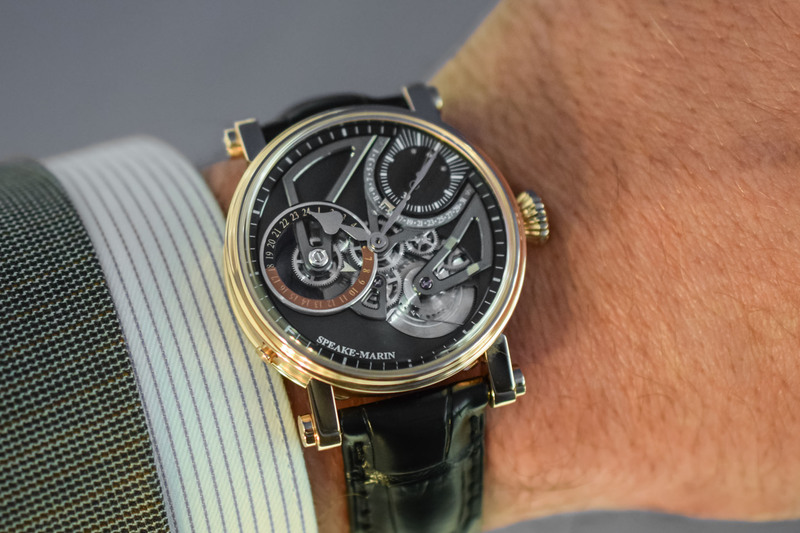 Looking at the dial for the first time, you will notice the totally eccentric layout and the clash of old and new with classic details like the golden hands juxtaposed with the colder, more technical bridges. Nothing is where you expect it to be, save the central hour and minute hands. Even if you are familiar with the unconventional location of the small seconds counter of the SMA calibre, you will see that in the model we are reviewing today, not even the numerals are upright but inclined at a 30° angle. The skeletonisation is more radical than on the previous One&Two Openworked model as is the more liberal use of colour. 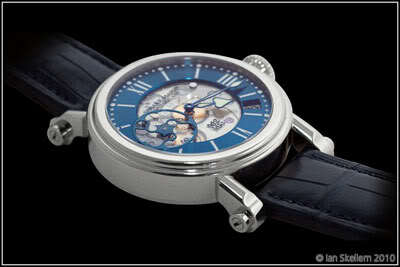 In spite of a large number of elements jostling for attention on the dial, the layout is “eccentrically harmonious”. Three elements stand out on the dial: the small seconds counter at 1:30, the two-tone GMT dial at 9 o’clock, and the exposed barrel at 5:30. Although the three elements are all treated with different finishes and positioned at different heights, they are triangulated to form a figure ‘3’. 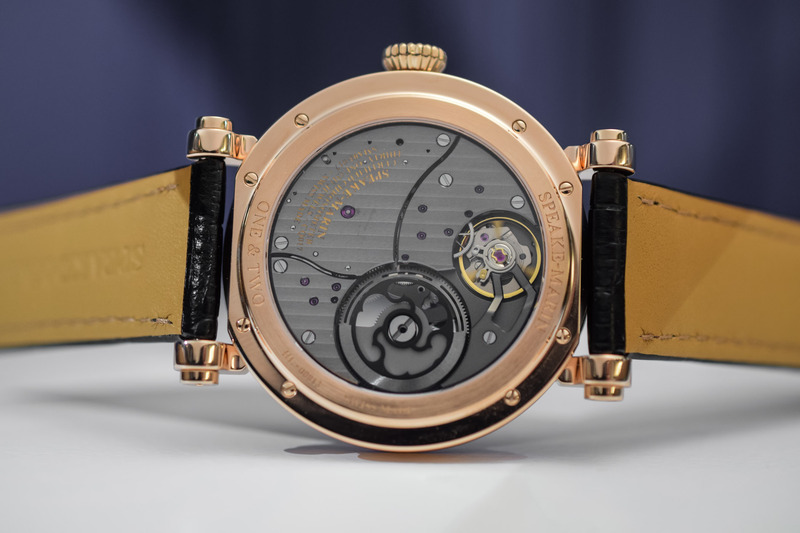 Given the multiple planes and dynamic architecture of the dial, let’s start at the top with the heart-shaped, centrally-mounted hands that everybody will recognise as quintessential Speake-Marin, and which are used to indicate local time. Moving down one level is the GMT indicator suspended over the micro-rotor and equipped with a golden arrow-shaped hand to indicate day (brown) and night (black) home times. Holding all the vital elements in place are the openworked, angular bridges finished in a technical, matte grey tone. A large cut-out at 5:30 reveals the barrel (with its wolf tooth ratchet wheel) and parts of the gear train. The solid areas of the dial are matte black, the same colour as the small seconds counter, which in turn cradles the retrograde date display. 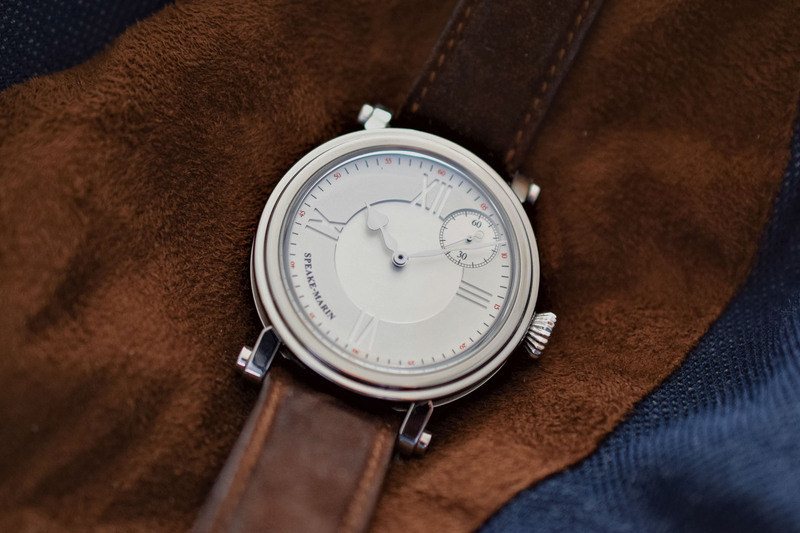 The retrograde date is crafted in the same material as the bridges and looks like a horseshoe fitted around the small seconds counter. The placement of the seconds counter so close to the crown and winding system, without any ring, attests to the sophistication of the module and the 31-day scale is indicated with a small golden window that jumps back to 1 at the end of the month. Turning the watch over reveals Speake-Marin’s proprietary automatic calibre SMA02 fitted with the dual time and retrograde date functions. The bridges are decorated with thin, vertical Geneva stripes and the micro-rotor is placed under the brand’s signature watchmaker’s topping tool. From a technical perspective, it runs at 28,800 vibrations per hour and boasts a 52h power reserve. Being able to consult local and home time at a single glance is a very useful function and a complication many travellers rely on. With its handsome masculine colour scheme, contrasting classical and technical elements, the One&Two Openworked Dual Time puts on an engaging show. This is not your conventional GMT watch; it is a refined, idiosyncratic timepiece for men who have no difficulty in reconciling classical watchmaking codes with more industrial, technical touches. A hybrid if you like, but it works. Presented in 38mm and 42mm red gold cases, each metal is a limited edition of 20 pieces and comes on an alligator grey crocodile leather strap and gold pink buckle. The 42mm model will retail for CHF 38,700. 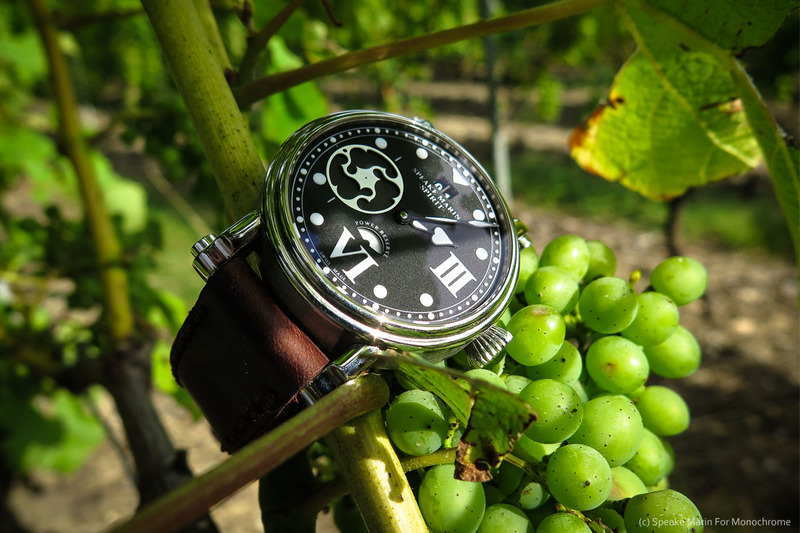 For more information, please consult www.speake-marin.com.